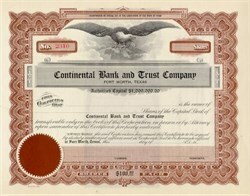 Beautifully engraved unissued Stock Certificate from the Continential Bank and Trust Company of Fort Worth . This historic document has an ornate border around it with a vignette of a flying eagle. Bank Certificates from Fort Worth are not very common.